The influence of Rafael Nadal seems like reaches far beyond the tennis court. 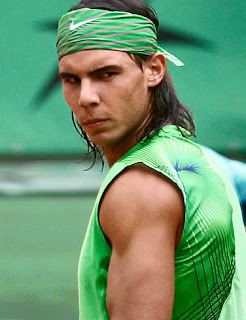 Nadal made it into the list of Top 49 Most Influential Men of 2008, released on Monday by Askmen.com. Back in August, AskMen.com, the world's leading men's lifestyle web site, asked its readers to help identify the most influential men of 2008: the guys who have had the biggest influence on the way other men behave, buy and think. More than 200,000 votes were cast and when the results are in, it is not a surprise that a number of prominent sports personalities have made the final cut – including Nadal. Nadal who is at no. 30 on the list had an overall score of 79.8 (82.5 from Askmen.com and 77.0 from readers). All sports need subplots, and Rafael Nadal supplied men around the globe with a scintillating story this year when he faced off against No. 1 seed Roger Federer in the Wimbledon finals for the third consecutive time. The pair proceeded to play the longest final in the tournament’s history, with Rafael Nadal coming out on top 4 hours and 48 minutes later with a hard-fought victory. Sports scribes and fans alike were left breathless by the phenomenal spectacle and three-time champ John McEnroe even went so far as to label it "the greatest match I have ever seen." Democratic presidential nominee Barack Obama tops the list of most influential men, followed by Apple Chairman and CEO Steve Jobs at No. 2 and American swimming superstar Michael Phelps at No. 3.